Boston Super-Sub, Brock Holt was originally a ninth-round selection of the Pittsburgh Pirates in the 2009 MLB Draft. He came to Boston as part of the six-player deal that sent reliever Mark Melancon to the Pirates in December of 2012. After spending most of his first season as a Red Sox with Pawtucket, Holt became Manager John Farrell’s super-sub in 2014, appearing in every position on the field except pitcher and catcher. A native of Texas, Holt played one year of college ball at Rice before being drafted. 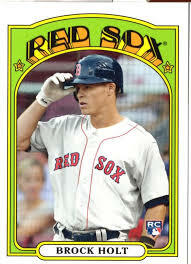 He currently is leading the Red Sox in batting average and has become a Fenway fan favorite because of his hustle and willingness to play anywhere.